Deepening the mystery of creation is science. Deepening the mystery of the self is spirituality. The purpose of technology is to comfort human beings. When spiritual values – human values – are ignored and neglected, instead of bringing comfort, technology brings fear and destruction. Technology without human values would see nature as a dead object. Science gives an insight into the life of nature and spirituality makes nature come alive. For example, in the eyes of children, there is nothing dead in the world animals, trees, the sun and the moon they all have life, emotions, feelings; but in the eyes of a stressed and ignorant person, even human beings are like robots objects! Technology without spirituality is destructive. Spirituality is the technology of consciousness, and the whole world is the play and display of consciousness. One who is not amazed by the magnificence of this creation, his eyes are not yet opened. Tell me, what in this creation is not a mystery? Birth is a mystery; death is a mystery. Then, life is certainly a greater mystery. Being completely immersed in the mystery of life and this creation is samadhi. Your knowing or believing doesn’t really matter. This creation is an unfathomable secret! A wise person makes no effort to conceal a secret. But he does not make an effort to reveal a secret either. For example, you do not talk about menstruation, death, etc. to a five-year-old, but as they grow older these things are not hidden from them any more. They become known as a matter of course. There are five secrets which are sacred and guarded by the subtle beings and angels in this creation. Janana Rahasya (the secret of birth): Birth is a secret. How a soul takes a body, the criteria for selecting the place of birth, time of birth, type of body, parents, etc are all a secret. Marana Rahasya (the secret of death): Death is a highly guarded secret. Death remains a mystery. The process of separation of spirit from matter and its journey from then on is a secret. Raja Rahasya (the royal secret, the secret of ruling): The principles of governing; the principles of maintaining the orderliness in creation are a secret. Prakriti Rahasya (the secret of nature): Nature is a mystery. The more you know about nature, the mystery deepens. The more a scientist knows, the more he feels there is much more to know. Science, though appearing to resolve the mystery in creation, has deepened it. The knowledge of particles, wave functions, black holes, the vacuum state, etc have only deepened the mystery. Mantra Rahasya (the secret of mantras): The mantras and their effect, influence, method and mode of working are all a mystery. Mantras are the impulses or rhythms of consciousness, which itself is a mystery. Usually in the West, a secret is shameful and dishonest. But in the East, it is honoured and regarded as sacred. Mysteries of the creation only deepen. Getting steeped in mystery is Devotion. Deepening the mystery of creation is science. Deepening the mystery of the self is spirituality. They are the two sides of the same coin. If neither science nor spirituality can create wonder and devotion in you, then you are in deep slumber. Whenever you consider a symbol, place, time, person or act as sacred, your attention is undivided and whole. When things are the same, you tend to slip into unawareness and inertia. Then why does an act when performed repeatedly lose its sacredness? This happens when your memory overpowers your consciousness and you lose your sensitivity. For example, people living in Benares do not feel that it is a sacred place. Through living in the present moment and through sadhana we can preserve that feeling of sacredness in our acts. There is a pleasure in rest and there is a pleasure in activity. The pleasure in activity is momentary and causes fatigue. The pleasure in rest is magnanimous and energising. So, to the one who has tasted pleasure in rest (samadhi), the pleasure in activity is insignificant. In order to have deep rest, one must be active. The proper balance of both is essential. Let us examine the five factors that influence the mind: place, time, food, past impressions, and associations and actions. Space: The place you are in. Every place you are in, has a different impact on the mind. Even in your house, you can see that you feel different in different rooms. A place where there there has been singing, chanting and meditation has a different influence on the mind. Suppose you like a particular place, you may find that a little later it will not be the same. Time: Time is also a factor. Different times of the day and year have different influences on the mind. Food: Different types of food that you take influence you for some days. The past impressions, the Karmas have a different impact on the mind. Awareness, alertness, knowledge and meditation all help erase the past impressions. Associations and actions: The people and events you are associated with influence your mind. In certain company your mind behaves in one way and with others in a different way. Though these five factors influence the life and the mind, know that the self is much more powerful. As you grow in knowledge, you will influence them all. The first is due to the place you are in. When you move away from that place, the street or the house, you immediately feel better. Chanting, singing, children playing and laughing can change this atmospheric restlessness. If you chant and sing, the vibration in the place changes. The second type of restlessness is in the body. Eating the wrong food or vata aggravating food, eating at odd times, not exercising, and overworking can all cause a physical restlessness. The remedy for this is exercise, moderation in work habits and going on a vegetable or juice diet for one or two days. The third type of restlessness is mental restlessness. It is caused by ambition, strong thoughts, likes or dislikes. Knowledge alone can cure this restlessness. Seeing life from a broader perspective, knowledge about the Self and the impermanence of everything. If you achieve everything, so what? After your achievement, you will die. Knowledge of your death or life, confidence in the Self, in the Divine, can all calm down the mental restlessness. Then there is emotional restlessness. Any amount of knowledge does not help here. Sudarshan Kriya helps! All that emotional restlessness vanishes. Also the presence of the Guru, a wise person, or a saint will help to calm your emotional restlessness. The fifth type of restlessness is rare. It is the restlessness of the soul. When everything feels empty and meaningless, know you are very fortunate. Do not try to get rid of it. Embrace it! This restlessness of the soul alone can bring authentic prayer in you. It brings perfection, Siddhis and miracles in life. It is so precious to get that innermost longing for the Divine. 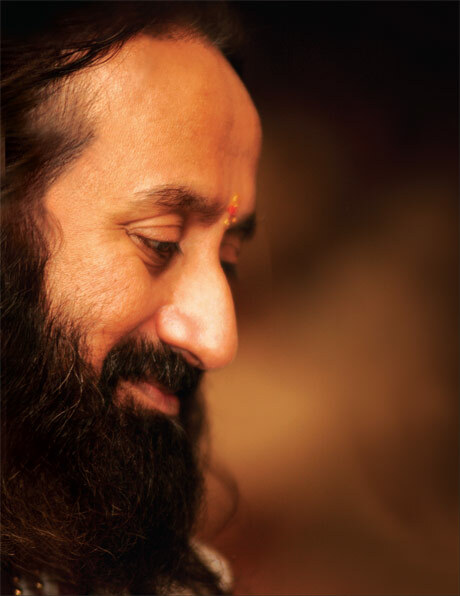 Satsang, the presence of the enlightened one, soothes the restlessness of the soul. Do not look for the Divine somewhere in the sky, but see God in every pair of eyes, in the mountains, water, trees and animals. How? Only when you see God in yourself. Only Gods can worship Gods. All of these together is Yagya. When you have reverence for the whole universe, you are in harmony with the whole universe. Then, you do not need to reject or renounce anything of this universe. When you have reverence in all your relationships, your own consciousness expands. Then even small things appear to be significant and big. Every little creature appears to be dignified. It is the reverence in every relationship that saves the relationship. Cultivate the skill of having reverence every moment in your life.